Bone volume fraction (BV/TV) is the volume of mineralised bone per unit volume of the sample. 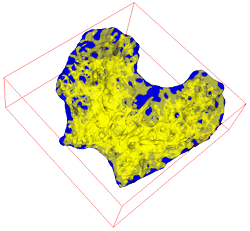 Volume Fraction provides two methods for measuring BV/TV: voxel-based and surface mesh-based. In the former, BV/TV is simply the number of foreground (bone) voxels divided by the total number of voxels in the image. In the latter, a surface mesh is generated using the foreground as a template and BV is the volume contained by the surface, while TV is the volume enclosed by a surface wrapped around the total test volume. Irregular 3D ROIs are supported for Volume Fraction calculations. Add 2D ROIs to the ROI Manager and select "Use ROI Manager" in Volume Fraction's dialog box. ROIs without slice information are projected through the whole stack, while ROIs with slice information are limited to their slice in the image. If an ordinary ROI is drawn on the image and "Use ROI Manager" is not selected, Volume Fraction is calculated for the pixels within the ROI. If no ROI is defined, it uses the whole image. Surface resampling: Amount of resampling to apply if the surface mesh-based algorithm is chosen. A higher value will run faster but will smooth over fine detail. Threshold: If a non-binary image is input, select a threshold in the threshold dialog and hit OK. Please be aware that the upper limit of the threshold is determined by the maximum pixel value in the current slice, not the whole stack. Use ROI Manager: restrict measurements to ROIs in the ROI manager. If no ROI is listed, the whole stack is used.